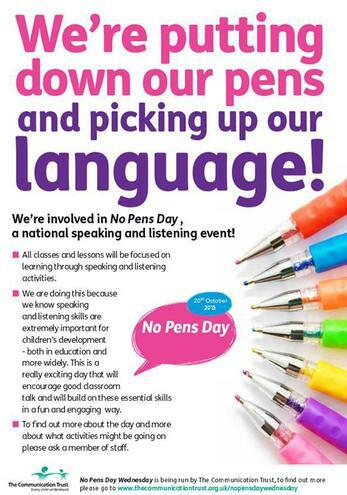 Northway has signed up again this year to the exciting one day event, which schools across the country are getting involved in called No Pens Day. The aim of the day is to encourage the skills of speaking and listening, which is a part of the national curriculum. Reading and writing are very important and valuable skills but people are often not aware of how important speaking and listening skills are too. Schools that include speaking and listening in a planned and structured way for children in their lessons see improvement in their classroom involvement. Ofsted inspectors are noticing more and more that speaking and listening is a really important factor for good teaching and child performance in successful schools. No Pens Day gives the children a chance to practice their speaking and listening skills for a whole school day. The day will allow all pupils in your child’s class to become involved in a whole school event, and to contribute to class activities, getting a chance to talk. Northway pupils will be able to use what they have learnt from this day throughout the school year. If you want to know more about this day, please speak to Miss McLachlan or your child's class teacher.